The influenza epidemic in Abingdon is still very prevalent and several deaths have occurred during the past week. Many tradesmen have experienced difficulty in keeping their shops open through loss of the help of their assistants. ‘Our Day’ celebrations for the British Red Cross, and other items, have had to be postponed. At the Abingdon County Bench on Monday, T. Hodnett, farmer, of Marcham, A. Cox, of Victoria Road, Abingdon, and Percy Dickinson, of Garford, were fined 1 shilling each for unlawfully buying and selling a horse, at Garford, against the Defence of the Realm Act during the last six months. Captain H. R. Hobday, R.F.A. of Broad Street, Abingdon, has been wounded the second time, and has had his left foot amputated. Up to the end of last month, by house to house collections in Abingdon, nearly £18 has been raised for the National Children’s Orphanage. Collections are being made under scheme carried out by Committee of ladies, to provide funds for sending Christmas parcels to Abingdon men serving with H.M. Forces. A meeting of the Abingdon Rural Tribunal was held on Monday at the Roysse Room in Abingdon, Mr H. W. Weaving was presiding. Percival Spencer, aged 38. Grade II, working at Milton Red Cross Hospital, was granted conditional exemption until January 1st, 1919 : A. E. Benwell, aged 45. Grade II., employed as farm labourer by the Earl of Abingdon, was granted exemption and excused V.T.C. untril February 1st 1919; and William Hale, aged 44, Grade II, from Kingston Bagpuize, huntsman at the O.B. H. Kennels, was exempted until May 1st, 1919, and also excused the V.T.C. 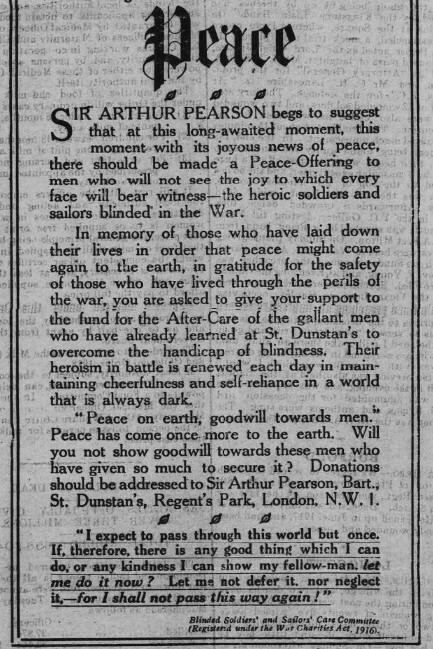 The news of the signing of the war armistice on Monday evoked great rejoicings in Abingdon, when almost a general half-holiday was given. The Pavlova Leather Works hooter sounded the news to the inhabitants. A thanksgiving service was held in the evening at St. Helen’s Church, at which the Mayor and Corporation, Borough Magistrates, Fire Brigade, and soldiers and staff of the local Red Cross Hospital attended. Suitable hymns and the Te Deum were sung. The service closed with the singing of the National Anthem. Sergeant James W. Parker, 22, Royal Berks, eldest son of Mrs Parker, West St. Helen Street, is reported to have died of wounds received on the last day of the war in Italy. He belonged to the Abingdon Volunteers, and was drafted out at the commencement of the war. He was an apprentice at Hughes Printing Works, Abingdon, and was a very promising lad. Private E. W. Savage, Canadian Regiment, second son of Mrs Henry Savage, of West St. Helen Street, Abingdon, is reported wounded in the left eye. A singular coincidence of two Abingdon lads is reported. They are the sons of Mr Ambrose Stone, The Vineyard, Abingdon. 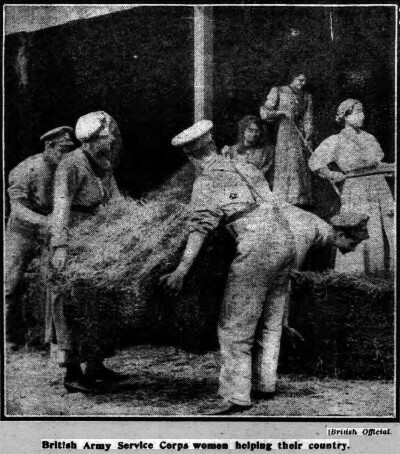 Early in the war one was officially reported amongst the victims of H.M.S. Natal when an explosion occurred, but was afterwards found amongst those saved, and just recently the other son belonged to the last ship that was torpedoed by the enemy, the Brittania, which was sunk on Saturday, November 9th, but was fortunate to have been granted leave, and was on his way home. Thanksgiving Services for the end of the War were held in the Churches and Chapels in Abingdon on Sunday last. The Warden of Radley College was the preacher at St. Helen’s Church in the morning. The Food Controller has sent £l2 to the children of the Dorchester Elementary School for having picked 970 lbs. of blackberries this season. The funeral took place on Saturday at Sunningwell, of Mr Thomas Sherman, aged 36, who died the previous Tuesday from illness contracted during the flu epidemic. He was a professional golf player at Frilford Heath Golf Club, in the early part of the war joined the Royal Berks, being made corporal of that Regt. He saw considerable service in France, and was severely wounded, subsequently receiving his discharge. Lieut. Bernard Aldwinckle, R.F.A., of Shippon, serving with the North Russian Expeditionary Force, died of wounds on November 3rd, at the age of 26. joined as a cadet, in the R.F.A., and went through the battles of Arras, Somme, and Cambrai. After leave the beginning of the present year, he proceeded to Russia on October 5th. 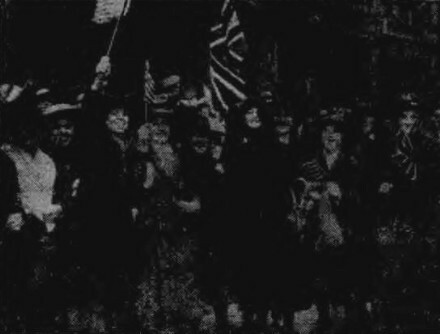 All details from https://www.britishnewspaperarchive.co.uk/ including one picture of rejoicing in Nottingham. 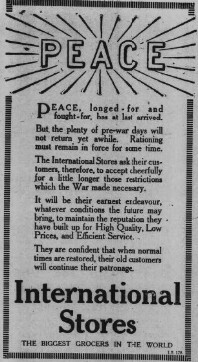 A souvenir edition of the Abingdon Herald will be published to coincide with the end of the war and will include a lot more.